You are here: Home / Blog / About Cancun and the Mayan Riviera / What to eat in Cancun during your dental vacation? Finding what to eat in Cancun might seem challenging at first during your first time on your vacation. Dental tourism in Mexico has increased in popularity and also the amount of American and Canadian patients wondering what can they try after their treatment is done. Cancun has a huge huge advantage over many other places in Mexico because, believe it or not, it is the melting pot of Mexico! The city it self only has 40 or so years since it was founded so people from all around the country came here to settle. These settlers also brought with them their favorite foods and recipes… making it very easy to find most of any type of traditional Mexican food. Obviously, the original regional food of the Península of Yucatan is the king in its presence. There are also a huge number of international restaurants and also many American restaurants. Of the things we can suggest about what to eat in Cancun are, of course, tacos. You can never go wrong with tacos. 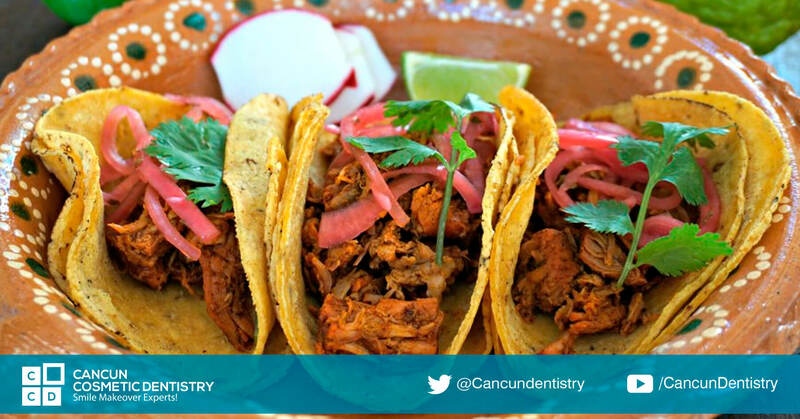 If you want to enjoy a local dish, ask for cochinita pibil… slow roasted and marinated shredded pork in achiote salsa, best eaten with pickled red onions and beans. Word of advice, if you are counting calories, forget about them and just try these. Also, just in general, beware of any salsa. Make this your rule of thumb. Even if they say it’s not spicy, your best bet is to try one, and just ONE drop of a salsa first… this is because this region of Mexico is completely in love with some of the spiciest chiles, called Habanero. Try it first and you should be fine. Some people are worried about what to eat in Cancun because they might believe there are unsanitary concerns, but restaurants here are required to follow hygiene codes. Perhaps the main thing to look out for is the spices and fiber used on these dishes. Local food is incredibly rich in spices and the use of chile permeates most local foods. You might be interested in: Where to eat in Cancun during your dental vacation?